Recently I had bought a multi-domain hosting plan with Hostgator to start three new websites: one, for my campsite in Himachal Pradesh, one for the adventure motorbiking tours I organise in Ladakh and one, for a new travel blog I wanted to start for so long. Please don’t ask why I started a new travel blog, that’s a long story and is moreover not necessary to know here. But what’s necessary is the fact that I switched from Bluehost to Hostgator to start my new travel blog (PS: I’ve been using Bluehost for some time for FootlooseDev) and I did it for quite a few reasons. One thing that makes a big difference every time we go to the market to buy something is the price of the product (or service) and this was exactly what motivated me too to make my decision and go for Hostgator. Though the hosting packages by Hostgator can be comparatively slightly expensive than that of Bluehost’s, from time to time, it offers amazing discounted deals. I used one such discounted deals too that gave me an unlimited domain hosting plan with Hostgator on a price almost similar to what the single domain hosting with Bluehost cost me. To make it better, it is moreover going to cost me cheaper to renew with Hostgator (once my subscription expires) than how much it cost to renew the same plan with Bluehost, as Hostgator offers better subscription-renewal rates. If you don’t know it already, be privy to the fact that renewing your subscription is always a pain and is always more expensive than your original plan. So if you end up buying hosting from a company that offers expensive renewal plans, you’re screwed! Another reason to switch to Hostgator was the praise I had heard from others about its servers’ performance. And since I’ve switched to Hostgator, I am, myself, witnessing it. There hasn’t been a single second of downtime in any of the three websites since the previous three months of my subscription. Though in this case, Bluehost had also, always, provided very sophisticated servers and I had hardly faced any technical issues with FootlooseDev in the previous two years, except for a few minutes of downtime every few months, and that is quite natural. And last but not least, Hostgator’s customer service is better too than that of Bluehost which no longer has a direct email-the-support option and require you to login to your Bluehost customer account and raise a ticket to exchange messages with the support team. Hostgator moreover offers an instant-chat option, something that comes in handy – particularly during the initial days of blogging when everything feels new and confusing. So Hostgator has it easier when it comes to technical support. However, if you still chose Bluehost, here’s an article on How To Start A Travel Blog Using Bluehost as your hosting server | Use this link to check Hostgator’s Website for discounted offers. The first step is choosing what hosting package you want: Single Domain or Multi-Domain. For newbie bloggers, it’s not necessary to get a Dedicated Server but buy a hosting plan under a shared hosting as there will be no traffic overload in the initial days of blogging. If you think you will be having more than one websites, invest in a multi-domain website. Additionally, if you know that you’re going to keep the website for some time, it’s always a good idea to buy a three-year hosting plan, because renewals are always expensive, as I said earlier. Once you’ve chosen what plan you want to buy and provided with the domain name you want to register, create your account, put in your billing details, and you’re good to go. Before checkout, you will be asked if you want any add-ons, forget everything in the beginning, except for Domain Privacy Protection because it will protect your personal information. All of the features that the rest of the add-ons provide can be achieved by downloading free plugins for your WordPress once you get your site up and running. Once you’re done with payment and have received the password and username for the cPanel, log-on to your cPanel and install WordPress onto your site. Once logged into the portal, you will see four tabs on top namely ‘Manage Orders’, ‘My Billing’, ‘Setting’, and ‘Help’. Click on ‘Manage Orders’ and under it, ‘List/Search Orders’. This page will have all your products listed. Click on the WordPress package that you just purchased and wait for the next screen. Scroll to the WordPress Hosting section and click on Manage Service. A new browser window will open which will be the dashboard we’ve been talking about earlier. Click on Install Site when you’re ready to start installing your WordPress blog. You will need to add necessary information about the site in the new screen and click on Add Site. Once the initial setup is complete, you get redirected back to the dashboard where you will find the new domain listed under Installed Sites. It may take up to 10 minutes for your site to build in the backend. 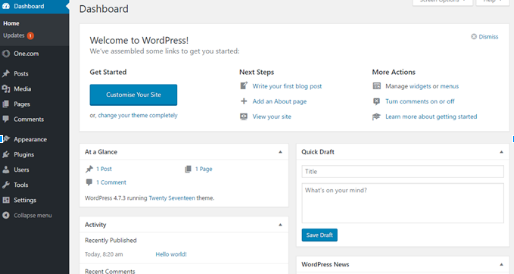 After the installation, you can hit the Admin button to log in to your WordPress blog. After you’ve installed WordPress, go to ‘http://YourTravelBlogName.com/wp-admin/’ and use the username and password you’ve created to log in. From now on, you are not required to log in to your cPanel buy your WordPress panel. To install a theme, click on the “Appearance” option on the left sidebar and then select Themes. Here you’ll find several themes that have already been installed. Just choose one of the Free Themes, in the beginning, give your blog some time to develop before investing a paid theme if you ever wanted to buy one. Besides themes, you may need to add some useful plugins from day one. Plugins basically enable you to add features to your blog without writing a single line of code. While there are thousands of plugins available, you initially need to install a few essential ones only. Easy Social Share Buttons – To add social media sharing buttons to your articles. Now that we have the theme and plugin out of the way, you’re ready to add your first blog. Congratulations! You have successfully created a website! If you think you’re going to buy a hosting plan from Hostgator, use this special referral code to get discounts. It’s moreover an affiliate referral link, meaning, any purchase using this link will help me earn a percentage of the total purchase (a win-win for both of us). Click here to go to Hostgator’s Website! This is such great information. I never heard of Host Gator before and need to check it out! I’ve never tried hostgator before but it sounds like their service is amazing! It’s good to find a host that wouldn’t let you down. It sounds like a great option! I did a lot of research prior to choosing who I would go with. I have heard a lot about this but not enough info on it. That sounds interesting, better check this out. admittedly I have not tried hostgator but I am looking for a new host so this is quite timely. Hostgator sounds pretty awesome! I’m using Bluehost, but if I have any issues, I will keep this in mind! I have heard good things about hostgator. I just switched from godaddy to another company last year and I’m so glad I did! I wish the best of luck to your travel blog! I wish I had the time to do some real traveling. I have been dealing with host issues and am looking to switch when my current contract is up for renewal. I will be keeping Hostgator in mind. This is so helpful! I’ll have to show this post to some friends who were looking to start a blog. Host Gator sounds great. Thanks for sharing your thoughts on a new hosting site. I have considered something new for my Christmas blog. This is making me consider it more carefully. I will definitely have to check into Host Gator. Sometimes the host I have right now does not always work as satisfactory as I like. It sounds like Host Gator might be a great place to go. I also use the JetPack plugin. They’re really improved a lot over the last year or so. For a long time, I was scared to use it because it was such a memory hog, but I feel like they really spend a lot of time developing a sleeker set of tools. Wow you are going to be busy running three blogs. I can hardly keep up with one. Haven’t heard of hostgator before. Something to look into that is for sure. I started my blog back in 2013 with Bluehost and had no problems for a while. When my first food video went crazy viral, my site crashed over and over from all the increased traffic and they didn’t seem to care. I had to move to a different hosting site right in the middle of the viral video. It was crazy, but I’m glad I left. Hostgator sounds like a great way to go. My blog used to be on BlueHost as well and I wasn’t thrilled with the overall service. The loading time was very slow, we were having strange issues that customer/technical support couldn’t help solve, and the price skyrocketed when our plan was over. Since we switched to HostGator, we’ve also been much happier. Blue Host used to be a good company to start a blog on, but recently their customer service and their server in general just haven’t been as great. Good to know that Host Gator is a better choice!